As the public filed through the Science Gallery Melbourne's exhibition Blood – Attract and Repel last year, 64 intrepid types agreed to be part of a scientific experiment. Unknown to the participants, the research students accosting people at the door were attempting to find out how blood thirsty we really are. 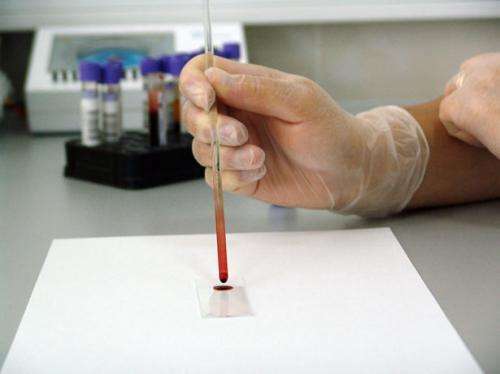 "The appetising effect of blood is really intriguing and definitely worth following up," says Will Turner, PhD candidate at the University of Melbourne's School of Psychological Sciences who led the research team of eleven students. "It was mainly a training exercise for us and a chance to engage people in how science is done. I didn't really expect to get anything much, to be honest, given the small numbers, but while the results can only reveal interesting trends because of that, they do hint at something going on that we may find better evidence for if we can do a more exhaustive study." Their installation Sentience featured in the exhibition and used Microsoft facial recognition software to translate people's different responses to smelling a blood scent into colours matching different emotional reactions – negative, positive, sad, disgust or fear. "There's not a lot of research out there on how blood may influence behaviour, and a strong focus of the work in the Decision Neuroscience Lab is about investigating the unconscious influences on our choices, especially our food choices, so it made sense to look at whether the smell of blood affects our choices," says Dr Bode. "The two opposing hypotheses we wanted to test was that – either people are repelled by the smell of blood, or else people find the smell of blood appetising." Their results suggested we have a complex, and perhaps equivocal, relationship with blood. People seemed to either like it or not, but the researchers speculate that responses may be influenced by someone's motivational state. However, the study also notes that research on rats suggests that the rodents aren't repelled by rat blood, but possibly by stress hormones in the blood. It cites an experiment in which rats in a maze avoided pathways spilled with the blood of stressed rats, but they did venture down paths spilled with the blood of un-stressed rats. A 2014 study by Linkoping University in Sweden found that predators like wild dogs and tigers were equally attracted to mammalian blood and an artificial scent - trans-4,5-epoxy-(E)-2-decenal - that gives off "metallic, blood-like" smell. "We have already shown in lab experiments that having consumed high-caloric drinks changes the way we make decisions. The next step for this research on blood would be to test whether people actually make different food choices after having smelled the scent of blood." "If follow-up research were to show that the smell of blood does indeed enhance our appetite, it would suggest that it is a reaction that has been hardwired into us over time rather than learned. It's not like the smell of coffee that you grow to like," says Dr Bode. "It would be more like some basic instinct." Careful, you'll make the Vegans slaughter herds of innocent vegetables.